೩.ಹುರಿದು ಸಿಪ್ಪೆ ತೆಗೆದ ಶೇಂಗ, ಗಸಗಸೆ, ಗೋಡಂಬಿ, ಎಳ್ಳು ತುರಿದ ಒಣ ಕೊಬ್ಬರಿ ಈ ಎಲ್ಲವನ್ನು ಅಕ್ಕಿ ಹುರ್ಗಡ್ಲೆ ಪುಡಿ ಯೊಂದಿಗೆ ಮಿಶ್ರ ಮಾಡಿ. ೪.ಒಂದು ಪಾತ್ರೆಯಲ್ಲಿ ಬೆಲ್ಲ ತೆಗೆದುಕೊಳ್ಳಿ ಅದಕ್ಕೆ ೧ ಬಟ್ಟಲು ನೀರು ಹಾಕಿ ಅದನ್ನು ಸಣ್ಣ ಉರಿಯ ಮೇಲೆ ಕರಗಿಸಿಕೊಳ್ಳಿ. ಈ ೫.ಬೆಲ್ಲದ ನೀರನ್ನು ೪ ನಿಮಿಷ ಕುಡಿಯಲು ಬಿಡಿ. ಗಮನಿಸಿ : ಬೆಲ್ಲ ಪಾಕ ಬರಬಾರದು. Roast rice on a hot pan till it turns golden. Let it cool down. Powder it with roasted chickpeas. Bring jaggery water to boil and let it boil for 4 -5 mins. Mix this jaggery syrup with the rice and chickpea powder. let it cool down. When the dough is manageable make equal sized rounds/laddo out of it. Enjoy when it is warm. This new to me. Would like to try it sometime. The photos are nice. Wow! 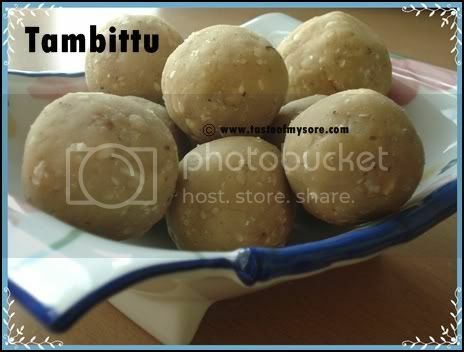 Mouth watering pics of tambittu! Never heard of this king of laddoo:) I must try it, your pictures were awesome! Like the all kannada writing..
Tambittu thumba denagalaaytu thindu.. jut want to have one ..
Wow, these look so tasty and mouthwatering. I remember these by name but been ages I think when I had them. laddos looks yummy & nice click..
Amazing unusal laddooes. Send me very few by parcels for us to pop and enjoy by thinking of you. They look yummy! Wonderful,tempting pics! I tried this today. This one is a keeper!! Nanna Hesaru Sunitha.Naanu karnataka Bhadravathi yalli hutti belediddu. nanna akka mysore alli eradu. Nimma blog nodi yestu santhosha aayethu andre adakke idannu bareethedinee. 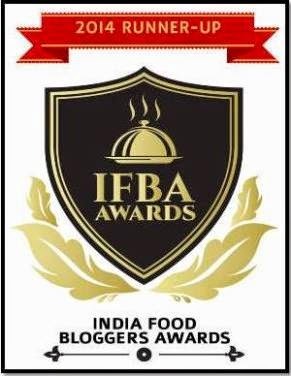 Naanu eega Australiadalli eddini nanage nimma adige blog nodtha idre india dalli iddeni anasathe. Neevu adige kalitha irodu keli santosha aythu. Bartha iri agaga blog kade. 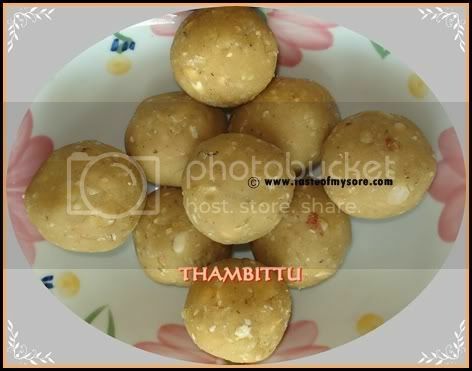 Lakshmi Akka:) Tambittu looks awesomeWant to make this for this year Shivratri. For the belada pakka one string consistency irrbeka? No, bella paaka barabaradu. Try it before shivaratri with little qty and test it out before you go upon trying large qty.